Now that weapons, knives, and duels have been discussed in the previous blogs, it’s time to talk about swordplay and knife-play. This topic is widely sought out by scholars, researchers and historians since studies on culture and military training in an individualistic setting are usually missing or hard to find (Jaquet 7). Swords and knives are practically found with every warrior since the beginning of the Medieval Century. But without technique, one cannot rise the ranks in their army. Majority of the warriors were taught by teachers or family members since school for military combat was too expensive and only nobles or royal knights could attend (Jaquet 552). Most of these lessons started with hand-to-hand combat to knives moving to wooden swords and financially practicing a certain technique with real/practice swords (Jaquet 547, 411). One reason why the school was so expensive could be correlated to the painting above. Saint Bartholomew, one of twelve apostles of Jesus is shown wielding a bible with his right hand and a knife on his left hand. It is believed that if you take up a sword under the name of God, you must be righteous and dignified. One way to be so during the Medieval era was to donate to the church. So if you were to take up sword lessons, the majority of the revenue would be donated to the church. There are many styles of swordplay and knife-play when the 15th century came around, but there was one technique that was most prominent, fencing. Johannes Liechtenauer, a German fencer, played a critical role in fencing-training with students (Wikipedia 1.2). The evidence of this lies in hundreds of Fechtbücher (fencing-books) being published with credits to Liechtenauer for originating the style or having an influence on a technique being created. Folio 80r. Wiktenauer contributors. “Albrecht Dürer.” Wiktenauer, the World’s Largest Library of HEMA Books and Manuscripts. Wiktenauer, the World’s Largest Library of HEMA Books and Manuscripts, 26 Oct. 2018, wiktenauer.com/wiki/Albrecht_Dürer. Folio 81r. Wiktenauer contributors. “Albrecht Dürer.” Wiktenauer, the World’s Largest Library of HEMA Books and Manuscripts. Wiktenauer, the World’s Largest Library of HEMA Books and Manuscripts, 26 Oct. 2018, wiktenauer.com/wiki/Albrecht_Dürer. In the images above from Albrecht Dürer, it demonstrates the positions and movements of fencing (Wiktenauer 2.2). It’s believed these illustrations come from Johannes Liechtenauer’s fencing style since these were made in the early 15th century in Germany. It was about the late 14th century to early 15th century that Liechtenauer’s fencing-style was being published (Wiktenauer 1). Some advantages of using the fencing-technique are due to its versatility. The method is popular with various types of weapons and is very suitable for broadswords and even daggers. With fencing, it can deliver strong, destructive blows or be used for parries. The structure technique is perfect for both light and heavy swords. The severity of the blow doesn’t determine how successful the attack is. But it’s the ability to disarm an opponent, the ability to deliver a second blow, footwork, and speed determines the success of a sword strike (Molloy 122). If a knight wants to change their sword to match a certain technique, they would “mill-sharpen” their swords. This means they would sharpen their swords, shorten their length, and or temper their weapons in a mill during the middle of battle (Walton 989). Once the sharpened sword is complete, most knights would be using the fencing style since it’s style is widely used by many swords or dagger types (Wikipedia 1.2). Folio 38v. Wiktenauer contributors. “Albrecht Dürer.” Wiktenauer, the World’s Largest Library of HEMA Books and Manuscripts. Wiktenauer, the World’s Largest Library of HEMA Books and Manuscripts, 26 Oct. 2018, wiktenauer.com/wiki/Albrecht_Dürer. In the images above from Albrecht Dürer, it demonstrates the positions and movements of using a knife (Wiktenauer 2.3). The major features of using a knife are to grab the opponent’s wrists and hands (shown with the blue figure in the top and the red figure in the bottom). By controlling the opponent’s wrists, it limits how they can move and allow you to stab or immobilize them. I believe the Wikipedia article I chose is a good article for my topic because the information correlates with the Albrecht Dürer illustrations on sword-play. The time period of the article matches with my primary and secondary sources (late 14th century to early 15th century). The article has information that spans after the time-period of this blog and how the variating sword techniques and combat styles originated from the source (Wikipedia 1-3). While I was researching the famous names in the article, particularly Albrecht Dürer and Johannes Liechtenauer, their names appeared on scholarly sources such as books and art pieces. With Dürer’s painting of Saint Bartholomew being one of the sources used in this project. The final reason this article is good for my topic is that they list the weapons types for some of the fighting styles, particularly fencing (Wikipedia 1.2). Jaquet, Daniel, et al. Late Medieval and Early Modern Fight Books: Transmission and Tradition of Martial Arts in Europe (14th-17th Centuries). Brill, 2016. Wiktenauer contributors. “Albrecht Dürer.” Wiktenauer, the World’s Largest Library of HEMA Books and Manuscripts. Wiktenauer, the World’s Largest Library of HEMA Books and Manuscripts, 26 Oct. 2018, wiktenauer.com/wiki/Albrecht_Dürer. Molloy, Barry. “Martial Arts and Materiality: A Combat Archaeology Perspective on Aegean Swords of the Fifteenth and Fourteenth Centuries BC.” World Archaeology, vol. 40, no. 1, 2008, pp. 116–134. JSTOR, JSTOR, http://www.jstor.org/stable/40025316. Walton, Steven. “Words of Technological Virtue: ‘The Battle of Brunanburh’ and Anglo-Saxon Sword Manufacture.” Technology and Culture, vol. 36, no. 4, 1995, pp. 987–999. JSTOR, JSTOR, www.jstor.org/stable/3106921. Wikipedia contributors. “Historical European martial arts.” Wikipedia, The Free Encyclopedia. Wikipedia, The Free Encyclopedia, 20 Dec. 2018. Web. 23 Dec. 2018. Now that we have talked about swords and knives, we can now talk about how duels are started. The phrase “throw down the gauntlet” means to literally throw your heavy gauntlet to your opponent to challenge them into a duel (Harrison). The challenged party would then have to take up the gauntlet and duel. With how honorable knights were back in that era, the could determine a battle if a knight was leading the battle (Harrison). The level of duels were sometimes miscommunicated. Sometimes the duelers were dueling to sever a limb, taking one’s life, or simply making a hit on their armor with now death. With duels being misinterpreted as that, many lives were lost and sometimes the battles wouldn’t end due to one believing a duel wasn’t fair. It was believed the first duels originated during the 5th century in the early Amorite kingdoms located at the Mesopotamia and Babylonia (present-day Western Asia) (MacDonald 147). In the Na’ar (Old Testament Hebrew Lexicon), it mentions people going about duels and how some will allow a person to earn a title. An armored man was summoned to duel a person with hardly any armor as punishment. As the one without any armor was able to evade his blows, the armored man was able to block his blows. The title for the armored man was armor-bearer (MacDonald 158). Most titles can be bestowed for having a father who was a notable knight (Macdonald 159). For example, one could say they are Scot, son of William. Where in this example, William would have been William the Great. In the picture, it shows how some duels are fought. Each person would have their respective weapons and armor. As shown, it could be interpreted that this duel was miscommunicated by the knights. The one on the right is trying to sever the other’s leg while the one of the left is going for the head and taking the kill. Or it can also be interpreted as the knight on the left is preparing a swing to take the leg while the knight of the right is having a swifter blow. Another huge factor in duels is that most blades are dull instead of sharp to prevent shattering or chipping of blades and ending a duel (Medieval Combat). Another technique used in duels are disarming techniques (Medieval Combat). If an opponent doesn’t have their weapon, they can either continue the duel and die or they can own their losses. Harrison, Elizabeth. “What Does It Mean to ‘Throw Down the Gauntlet’?” History.com, A&E Television Networks, 26 Mar. 2014, www.history.com/news/what-does-it-mean-to-throw-down-the-gauntlet. MacDonald, John. “The Status and Role of the Naʿar in Israelite Society.” Journal of Near Eastern Studies, vol. 35, no. 3, 1976, pp. 147–170. JSTOR, JSTOR, www.jstor.org/stable/544342. “Medieval Combat.” All-Gauge Model Railroading Page, Milihistriot Quarterly, http://www.thortrains.com/getright/Medieval Combat.htm. Knives (or daggers) played a huge role during the medieval era since it is the last resort weapon for every knight and warrior (Dandridge 145). The first knife was created during the prehistoric era and has constantly evolved since then. The first metal knife was made during the Bronze Age (3000 BC – 1200 BC) in present-day Norway (Dandridge 148). Knives were also assumed to be used to cut off fingers, ears, heads, or toes of tough opponents to keep as spoils of wars or turn in bounties. The knives were made with stronger hilts compared to other swords and a secure pommel (Dandridge 148). The daggers were also strong enough to stab through chainmail (Medieval). In the picture, King Arthur’s Round Knight Perceval is shown sleeping on the shoulder of a lion. It shows his knife on his side on the bottom right corner. This painting was created during the late 14th century and symbolizes after a grueling battle, you can always rely on your knife. In the painting, there is a second panel where it shows his dream of him combating a dragon rider and a lion rider with his dagger. This shows that noble knights are willing to fight to the end even if their blades and shields are destroyed. With a knife, it can be used to win the hardest battles and collect spoils of wars. Knives can also be seen as a dangerous weapon if you have it as a hand. During an excavation of 1985, there was a corpse of a man who had a missing hand but a dagger in its place (Frost). It was suspected that a knight lost his hand during battle through an amputation and used a dagger as a prosthetic hand. It was also suspected he lost his hand through capital punishment (Frost). However, it is known to be an intimidating weapon when you get into bar-fights or small-town skirmishes (Frost). Knives come in varying sizes and shapes. They could either be double-edged or single-edged, curved or straight, short or long, and more (Dandridge 148). But it can be assumed that most daggers used for battle can be about the size of your forearm (Medieval). Dandridge, Pete, and Mark T. Wypyski. “Sword and Dagger Pommels Associated with the Crusades, Part II: A Technical Study.” Metropolitan Museum Journal, vol. 46, no. 1, 2011, pp. 145–152. JSTOR, JSTOR, www.jstor.org/stable/10.1086/668456. Frost, Natasha. “This Medieval Skeleton Has a Knife for a Hand.” History.com, A&E Television Networks, 17 Apr. 2018, www.history.com/news/knife-hand-skeleton-prosthetic-discovery-italy. The Scimitar is associated with the Saracens from Arabia Petraea (Scimitar). It is also commonly associated in the Holy Land as well (land between the Jordan River and the Mediterranean Sea in today’s geography). It originated from Arabia while it was in the Roman Kingdom and was popular during the 13th century (Staff). This weapon was commonly used to fight against the Crusaders and against the Crusader Sword. It was a common weapon to use on horseback due to how light it was and its distinct curve (Staff). It was highly effective against armored knights due to the distinct curve, the force generated while on horseback, and how much swifter the blows can be delivered compared to the Medieval Arming Sword (Staff). The length of the sword was typically 30 to 36 inches (with 3-4 inches being the hilt size and the rest being the blade size) (Scimitar). The Scimitar weighed between 3-4 pounds with a width of 2-3 inches. Its hilt is considered smaller than the Medieval Arming Sword (can be distinguished in the Scimitar picture and from the Medieval Arming Sword picture from the previous blog). This sword wasn’t ideal for stabbing enemies but was considered the gold standard for slash wounds. During the Second Crusade, the Scimitars play a drastic role in the Salahuddin army in the 12th century (Staff). It completely outclassed the Crusader Sword due to the Scimitar’s superior speed, ability to parry blows due to its curve, and effectiveness while on horseback. After the showing of the Scimitar’s lethalness, it was also used by the Mongols, Rajputs, and Sikhs (Staff). Jean d’Alluye from the Abbey of La Clarte-Dieu based from France depicts the model of an ideal knight. With a long-sleeved and hooded mail shirt, mittens, coif, spurs, a Crusader Sword, and a shield, this was the outfit of a knight of the 12th-13th century (Nickel 123). Although this was the image of a knight, he depicts how a Scimitar from the Islamic world can cause damage to this knight of the 12th-13th century (Nickel 123). However, there aren’t a lot of Scimitars preserved as well as the Crusader Swords or the Medieval Arming Sword. This was most likely due to the hilt being smaller, making it easier to break during battle (Nickel 126). “Scimitar.” Life in the Middle Ages, Lords and Ladies, http://www.lordsandladies.org/scimitar.htm. Nickel, Helmut. “A Crusader’s Sword: Concerning the Effigy of Jean D’Alluye.” Metropolitan Museum Journal, vol. 26, 1991, pp. 123–128. JSTOR, JSTOR, www.jstor.org/stable/1512905. Staff, Editor. “Scimitar.” Medieval Middle Ages, Medieval Middle Ages, 8 Feb. 2013, http://www.medievalmiddleages.com/weapons/scimitar.html. The Medieval Arming Sword was considered the most popular secondary sword in the 15th century due to being lighter, shorter, but still deadly (Willis). With the increasing popularity of longswords and greatswords in the late 14th century to early 15th century, most knights wielded two blades (a longsword or greatsword paired with a Medieval Arming Sword) (Medieval Swords). The reason why it is called the Medieval Arming Sword is that once you lose your larger sword or if you end up in a situation where you can’t freely swing your longsword or greatsword, you would arm your secondary sword (in this case, it would be the Medieval Arming Sword) (Willis). It was believed the first locations these Medieval Arming Swords originated from was modern-day Belgium (Willis). The length of the sword was typically 30-35 inches (where 4-5 inches is the hilt size and the rest being the blade size) (Willis). The Medieval Arming Sword weighed between 2-4 pounds and the width of the sword was 2-2.5 inches (Willis). With the style of this blade, it allowed for easier, swifter, and more accurate blows. This also allowed users to dodge and evade blows from enemies wielding large, double-handed weapons (Medieval Arming Sword). In the picture, it shows how smaller it is compared to the previous Crusader Sword in the past blog post. With the smaller length of the blade and how it was lighter than regular broadswords, women favored the Medieval Arming Sword (Stock 56). Most of these swords were hidden in a women’s leg armament strap so they could assassinate or kick people out from bars and taverns (Stock 57). With the hilt being a perfect size (sample hilt in the picture) and weight to move around in, it made women effective warriors back in the 15th century. It was reported that some women were trained to use swords and weapons during the 12th century (Stock 56). With the rise of women during these centuries, some even armed themselves in armor and became knights while hiding their identity has a woman (Stock 61). The Medieval Arming Sword in the picture is also a common sword found in Amazon warrior depictions and art (Stock 63). Willis, Wil. “Medieval Arming Sword.” History.com, A&E Television Networks, 20 July 2015, www.history.com/shows/forged-in-fire/season-1/episode-5. Stock, Lorraine Kochanske. “’Arms and the (Wo)Man’ in Medieval Romance: The Gendered Arming of Female Warriors in the ‘Roman D’Eneas’ and Heldris’s ‘Roman De Silence.’” Arthuriana, vol. 5, no. 4, 1995, pp. 56–83. JSTOR, JSTOR, http://www.jstor.org/stable/27869148. “Medieval Swords.” Life in the Middle Ages, Lords and Ladies, www.lordsandladies.org/medieval-swords.htm. “Medieval Arming Sword and Falchion.” All-Gauge Model Railroading Page, Milihistriot Quarterly, http://www.thortrains.com/getright/drillmedarmsword1.html. The Crusader Sword is a mighty sword introduced in the 6th century and a common sword for Crusaders during the 12th-15th century (Medieval Swords). It wasn’t the most popular sword during the 6-11th century due to other broadswords being more popular (Medieval Swords). It became a favored sword ever since the First Crusade from 1095-1099 and has been an iconic sword from that battle (Willis). 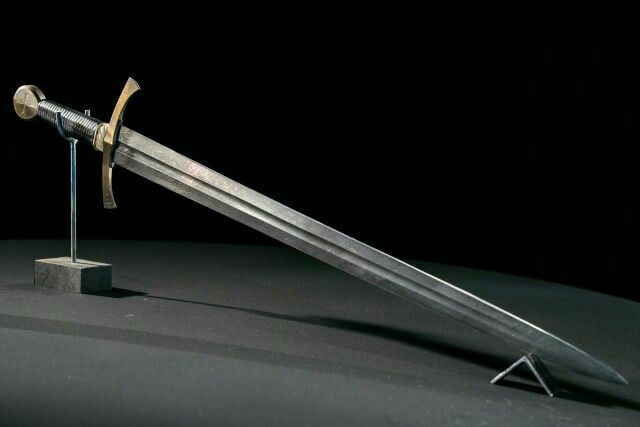 Due to all the pillaging and people taking their spoils of war, it is hard to determine where the first Crusader Sword was made in the 6th century. But it is believed it may have originated in East Europe (Willis). After the First Crusade, there was a mass production of these swords since it symbolizes a person’s faith to God (Willis). The length of the sword is typically 30-45 inches (where 4-5 inches is the hilt size and the rest being the blade size) (Willis). It weighed between 3-5 pounds and the width of the sword was 2-3 inches (Willis). It is similar to a broadsword in size comparison, however, the only difference is the hilt and how the blade is made (Medieval Swords). In the picture showing a Crusader Sword, it shows a gradual fading so the edge of the blade doesn’t have 3 points like a typical broadsword (Willis). As for the hilt, broadsword is generally more curved while the hilt for the Crusader Sword pictured in this blog is wider (Willis). The Crusader Sword is also paired with a scabbard where most warriors and knights hold on their right hip just like the broadsword pairings (Catling 143). It was suspected Sir Arnat Visconti’s (a 14th century noble from Cyprus) sword was a Crusader Sword (Catling 142). With his sword in his right hand, it paired well with his heart-shaped shield with his 2 wyverns (Catling 142). Just like Sir Visconti, other notable 14th century knights used Crusader Swords such as Sir John Tenouri, Sir Thomas Prevost, Sir Philipe de Milmars, Sir Heude de Vis, Sir Thomas de Montholif, Sir Aigue de Bessan, and Sir John Antiaum (Catling 143). It was especially common to use this sword from those who are affiliated with the Church of the Augustinians, Nicosia in the mid-late 14th century (Catling 143). Willis, Wil. “Crusader Sword.” History.com, A&E Television Networks, 21 Aug. 2018, www.history.com/shows/forged-in-fire/season-5/episode-24. Catling, Hector W. “A Medieval Tombstone in the Paphos Museum.” British School at Athens Studies, vol. 8, 2001, pp. 139–144. JSTOR, JSTOR, www.jstor.org/stable/40960555.